Herb Schwede’s interest in cemeteries started a few years ago when he and his sister June Myers researched their own family tree. “Now, we have information back to the 1850s on where our family came from in Germany,” he said, “but the Aurelia Cemetery up here, that’s what I started out with.” More than 68,000 graves later, recorded in both his own computer files and at the Find A Grave website at www.findagrave.com, Schwede could be considered somewhat of an expert on the cemeteries of northwestern North Dakota. More than 68,000 graves later, recorded in both his own computer files and at the Find A Grave website at www.findagrave.com, Schwede could be considered somewhat of an expert on the cemeteries of northwestern North Dakota. Schwede joined the website and posted the graves he had from his own list. “Then I just went out [to a different cemetery] and started writing down names and dates,” he said. Some tombstones are so weathered that none of the words remain legible, but Schwede makes a record of the stone and location anyway, just in case. “That’s the end of it, pretty much,” he said. Few of those 50,000 photos have ever been printed, but they are all stored on his computer. “Except for Parshall,” he said, with a smile. “I lost them somehow.” He has since returned to the Parshall cemetery and photographed the tombstones again. 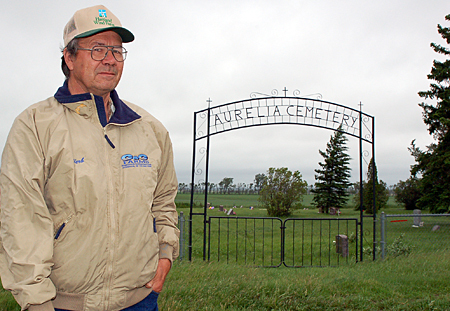 Schwede devotes his spare time to his cemetery research and recordkeeping. Known to most area residents as a longtime bus driver for the Kenmare School District, he raises cattle northwest of Donnybrook and also works for C & C Farms. In addition to his work on the Aurelia Cemetery board, he serves as secretary/treasurer for the Donnybrook Fire Department, assessor for Carbondale Township and a member of the executive board for the Mouse River Loop Genealogy Society in Minot. “I got into that when Frank Kirkelie found about what I was doing with the cemetery stuff,” he said. City and cemetery officials who are aware of Schwede’s hobby have benefited from his records. The city of Kenmare has a copy of his records for the local cemeteries, and he has shared his information at the request of other communities, too, including an up-to-date listing for Bowbells he recently completed. People from around the world search findagrave.com for connections to their own family histories, with the website organized to allow searches by names, cemetery locations and burial records. Graves of related individuals can even be linked to each other. He has been contacted by individuals as far away as Norway, Finland and Sweden seeking relatives and their descendants who immigrated to the U.S. Another interesting request came from two parties in England. “They didn’t know each other, but they were looking for the same family here,” he said. The requests may be for more information about the graves or the cemetery, or to make corrections to Schwede’s data. Sometimes, Schwede is asked to send a photo of the grave marker, or he’s told about another cemetery he should visit. The little cemetery near Wolford will be a new addition to the findagrave.com website as Schwede adds a page with the information he found. Schwede hasn’t yet uploaded every one of the 50,000 photos in his collection, but he does his best to accommodate requests for particular pictures. He also keeps his cemetery records updated by checking obituary lists from area funeral homes, and he has started copying and pasting some obituaries from funeral home websites to the findagrave.com site. He noted that Find A Grave frequently adds new features to the site, with one of his favorites being the “virtual cemetery.” Schwede has created six such cemeteries, including four for specific family names, one for his former teachers and one for former students who rode his school bus. “I like that part of the website,” he said. While an old country cemetery may appear to be an uneventful place, Schwede finds plenty of questions and stories lingering among the tombstones. “I’m not surprised by anything anymore,” he said. He described one the first cemeteries he recorded, with a couple hundred graves. “There were only two people between the ages of 12 and 53 buried there, and both of them were killed in accidents,” he said, adding that most of the other deaths were due to illness or old age. He came across one celebrity grave in a small cemetery near Drake, that of Sondre Nordheim, a Norwegian immigrant and a devoted skier who transformed alpine skiing techniques and essentially developed the telemark skis used today. He paused and shook his head. “I’m starting to hate lilacs, when I have to crawl inside of them to find a tombstone!” he said. That frustration spurred one of the rules Schwede imposes on his own work with grave records: he refuses to post information to findagrave.com without the name of the cemetery. Schwede enjoys getting out during the summer to take his photos, then uses rainy days or winter time to update his database. Although he has recorded most of the cemeteries in this region, he plans to continue his hobby even if it means driving longer distances.